As instructors we’re always looking for ways to alleviate student boredom and liven up our classes. You and I know that boredom is enemy numero uno of student retention, so anything we can do to punch boredom right in the solar plexus and drop him to his knees gasping for air like a chain smoker after a half-marathon is a good thing, right? Yep, that’s right. Mix it up. If you’re stuck following the same-old-format of a 20 minute warm-up, 15 minutes of basics, 15 minutes of kata as a group with the same 2 people falling behind (yawn) and finishing with 10 minutes of kumite my suggestion is that you flip your class plan on its head. How about use your basics as a warm up by easing into the technique working at about 50% for the first few minutes? 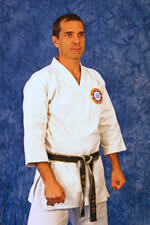 Then do some kumite for 15 minutes, using various drills and exercises followed by some kata and a stretch? Your students won’t know what hit them. They’ll feel stimulated and excited, and will be thankful you’ve banished boredom from their lives for the time being. Yes, you’re an awesome instructor and nobody can do as good a job as you, right? Of course not. But you only got as good as you did through practice. So how about you give one of your senior students the opportunity to become a great teacher just like you? I’m sure you’ve got a certain style that resonates with certain students. And then there will be some who will be on a very different wavelength to you, which might be a perfect match for one of your senior students. Your new instructor might explain things in a slightly different way that will give some of your dedicated followers a light-bulb moment. It might be just the thing they need to fix that issue with their technique you’ve been hounding them about for the last 2 years. Go on, try it. Let go of the reigns and let someone else steer your coach every now and again. Seriously, training outside brings a lot of benefits to the table. Students will learn that things aren’t perfect like they are in your dojo. There are no mats, mirrors or equipment. The ground is uneven, and you can decide if your class will wear shoes or train bare footed – just like in the old days. (Your Okinawan forefathers would be proud). You could have your class train in regular clothes for that matter – it’s all still karate, right? DISCLAIMER: For the overly cautious, paranoid or simply sensible people, choose a location that is safe, and only do this with students who are old enough and mature enough to handle it. Personally I wouldn’t be taking a bunch of 6 year olds into the parking lot – your insurance probably won’t cover you when your karate kid tries a crane kick on a fire-hydrant and impales himself. Thanks for the helpful tips my friend. I have always been one to mix up things in class. I hope all is well with you. I will look forward to any future tips to better my class. Keep up the good work. Glad you like it David… I really enjoy outside training. Nice change of environment, fresh air (cough, cough) for the most part, and it helps develop environmental awareness… Have fun! Oh yeah, Environmental Awareness… One of the most overlooked aspects of self defence and most Karate schools don’t teach it. thanks for your tips I am using tip 2 and 3 already thanks for number one it will be tried also. Thanks for this these tips Jason I will surely try them and bring new energy and vigor to my class, thank you and God bless!!! Great ideas! We just revamped our format after reading your advice on warm ups last month, and it has been a success. Boredom wasn’t just a problem for the students; I had to do the same warmup 8 times a week. Excellent Jim! I know what you mean, that’s why I have my assistants teach the warm up!